Use this calculator to find the money you’re leaving at risk with poor plan execution. 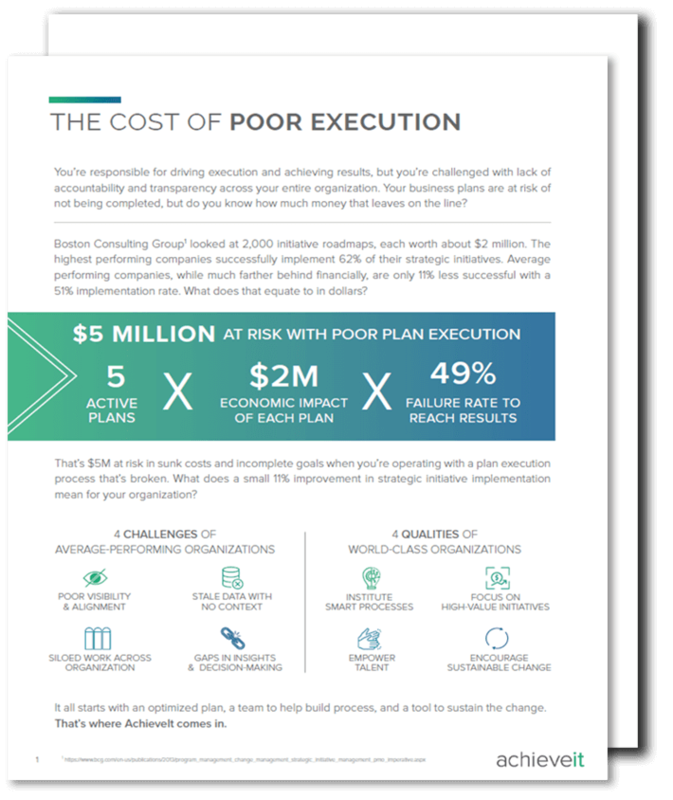 Poor plan execution is demoralizing, but what many don’t realize is that it’s actually costing your organization a lot of money. Research from Boston Consulting Group found that while no organization executes 100% of their plans all the time, there is a correlation between financial performance and the number of initiatives that are implemented: top performing companies complete a much higher percentage of their plans. Funneling resources into plans that are never actualized is expensive. But as you lead plan execution for a cross-functional team, you struggle with lack of accountability, highly siloed departments, ever-shifting priorities, and a culture that’s slow to change. This is all on top of the amount of time you waste manually compiling status update reports from disparate systems. What you may not realize is that lack of alignment, context, and visibility creates gaps in insights and decision-making. This is more than just frustrating – it’s inhibiting your ability to execute. And that’s worth hundreds of thousands of dollars. Use this calculator to determine what your current plan execution process is leaving at risk for your organization and learn what you could gain with AchieveIt. This is how much money you’re risking with a poor execution process. As your scope and number of plans rise, a poor completion rate will exponentially increase the amount of resources that are eaten up without results to show for it. This is how AchieveIt can rescue you. Download this printable to share the results with your team. WANT TO LEARN MORE ABOUT ACHIEVEIT?I'M INTERESTED. LET'S TALK!I'M ALL SET. NO NEED TO FOLLOW UP.